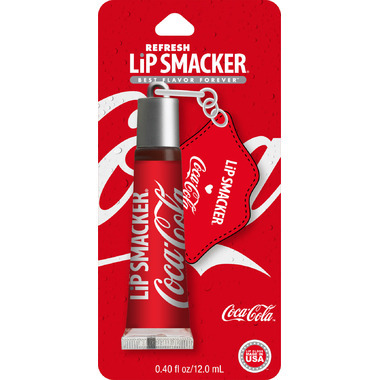 Quench your thirst with this Lip Smacker Coca Cola Refresh Lip Gloss that moisturizes lips with an invigorating cooling sensation! 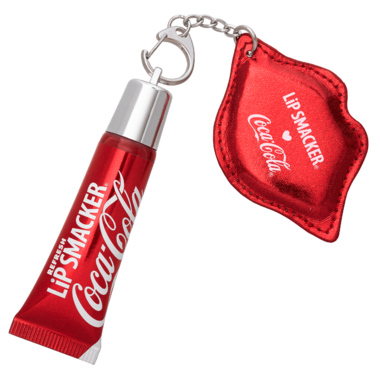 This high-shine lip gloss is perfectly portable and comes with a bonus keychain. Ingredients/Ingrédients: Isopropyl Palmitate, Polybutene, Caprylic/Capric Triglyceride, Diisostearyl Malate, Ethylene/Propylene/Styrene Copolymer, Butylene/Ethylene/Styrene Copolymer, Flavor/Aroma, Triethylhexanoin, Simmondsia Chinensis (Jojoba) Seed Oil, Phenyl Trimethicone, Silica Dimethyl Silylate, Dioctyldodecyl Fluoroheptyl Citrate, Phenoxyethanol, Sorbic Acid, Menthoxypropanediol, Sucralose, Stevia Rebaudiana Leaf/Stem Extract, Tocopheryl Acetate, BHT, Tocopherol. May Contain/Peut Contenir: Iron Oxides (CI 77491, CI 77492, CI 77499), Mica, Red 30 Lake (CI 73360), Red 7 Lake (CI 15850), Titanium Dioxide (CI 77891), Yellow 5 Lake (CI 19140).